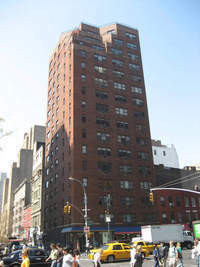 105 West 13th Street is an 84 unit postwar in Central Village location. Please upload a copy of Contract of Sale. Please provide most recent federal income tax returns with W-'2's. Please upload Landlord/Managing Agent's Reference Letter. If Financing, please upload: a) Copy of Loan application to the bank b) Copy of Appraisal Report c) Copy of Bank Commitment Letter. Please complete Flip Tax Computation Sheet. (enclosed) Flip Tax Info Enclosed for Informational Purposes. Please complete House Rules Acknowledgement. (enclosed) House Rules enclosed for informational purposes. Please upload two (2) letters of bank reference. Please upload three (3) business letters of reference. Please upload a reference letter from present landlord or managing agent. Please see Option 1 of attached for additional more information. Please upload Verification of Current Mortgage. Please upload an Appraisal Report. Please upload three (3) Recognition Agreements, which must be signed by the shareholder. Please see Option 2 of attached for additional information. Please upload Verification of Current Mortgage - to include principal balance and monthly payment. Please upload Employment Letter - which must include salary and start date.